This is the song of the year by a country mile, and also by a city mile, and by a nautical mile, too. Nobody else is writing at Christine’s level. Maybe he should have included kilometres, as that's what we use up here in Canada (and most of the rest of the planet), but you get the idea... he thinks she's fantastic. 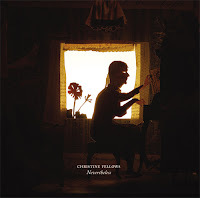 Darnielle also brought Christine out on tour as his opening act which no doubt snared her a number of new fans, but what this post is about is that you can glom onto Fellows and her music. She deserves a bigger audience and has just released a brand new record called Nevertheless, on which she continues to display an editor's, or better, a poet's touch, when penning her tight concise lyrics, a skill developed over three previous solo efforts: 2 little birds (2000), The Last One Standing (2002), and Paper Anniversary (2005). But it isn't just the minimalism that appeals to me, it's her voice, as well. It's not showy, or affected, it simply rings and chimes from her throat with honesty, completely unfettered, a perfect vehicle to deliver her lyrics. An interesting aside, Fellows is married to John Samson, the leader of Winnipeg band, The Weakerthans, you might want to check out them, too. bought one of her albums a while ago.